Paging Buffalo developers and restaurateurs. There is an Ohio-based grilled cheese chain that must expand to downtown Buffalo. 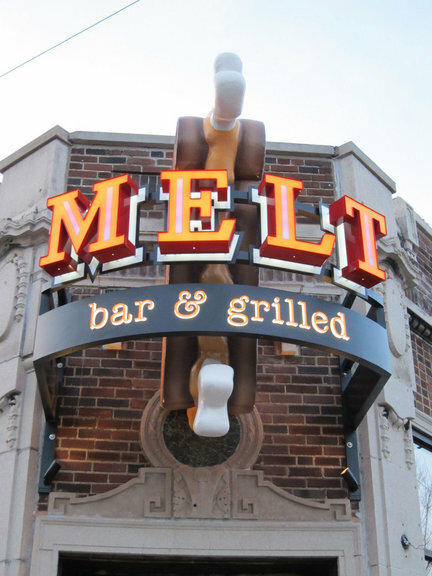 Melt Bar and Grilled serves up all sorts of creative takes on grilled cheese sandwiches along with craft beers to residents of greater Cleveland and Columbus. I was lucky enough to choose the Short North Melt location for lunch during my recent jaunt to the Buckeye State and I’m so glad I did. This is a sandwich served at Melt. Do you need any more evidence? 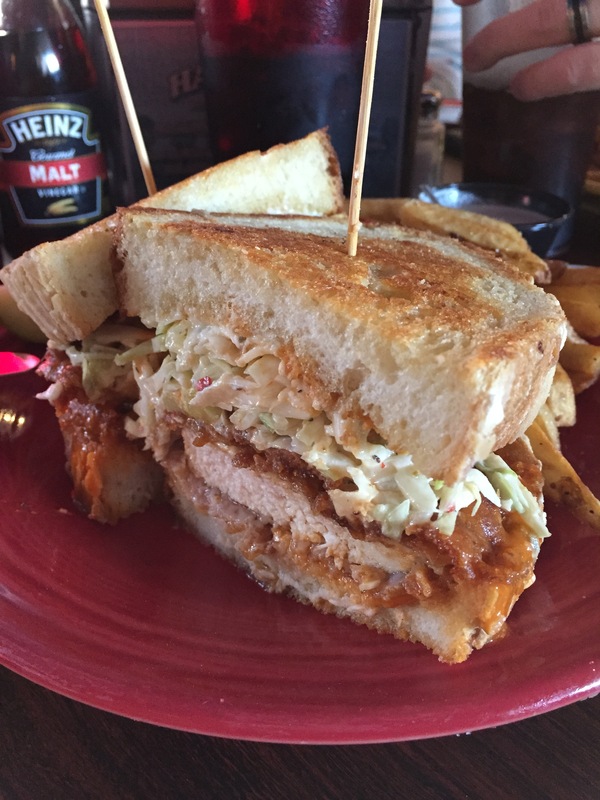 The Wet Hot Buffalo Chicken isn’t so much a grilled cheese sandwich as it is a chicken finger sub served on Texas Toast. Bonus points to Melt for serving the sandwich with blue cheese rather than ranch as the standard. Also, bonus points for having a chicken finger sandwich on the menu outside of WNY. Further bonus points for featuring a sandwich called The Dude Abides. Melt’s food is terrific. All four of us got different sandwiches – including one breakfast grilled cheese – and we were all incredibly impressed. What adds to the entire experience is the eclectic atmosphere inside the restaurant itself. You might say there’s something of a hippie vibe to the place, but I’m not sure that’s an entirely fair assessment. The bar fridges have old arcade game marquees on them and the menus are on the back of album covers. It’s a very cool spot that fits in beautifully in an urban setting; and Buffalo desperately needs to be on their radar. One thing about this: they have to locate downtown. I realize spots near the Galleria or up in the Northtowns are the typical landing spots for chains, but this place screams downtown Buffalo. It’s hip, unique and would seamlessly blend into the fabric of many city neighborhoods. Larkinville and Allentown immediately spring to mind when I think of the atmosphere inside the Melt location I stopped at but I could also see this as an awesome addition to the right portion of Main Street as well. Canalside is actually the most obvious choice, but they’re development speed appears to be somewhere between a crawl and reverse at this point. A somewhat out-of-the-way spot would be Darryl Carr’s smith shop at 120 South Park. While it wouldn’t necessarily have the curb appeal that you’d get on Chippewa or Main, it would be a very cool addition to the Cobblestone District. If I had to pick, I think my first choice would actually be Carr’s smith shop on South Park. Carr, the owner of Cobblestone, has done his best to not do anything with the property but has recently been in hot water with the property and will finally be beginning renovations on it after pleading guilty to numerous code violations. While he doesn’t strike me as the type who would want another bar sitting next door to Cobblestone, the building and district would greatly benefit from adding something such as Melt to the ground floor. By renovating the upper floors into apartments and putting a bar/restaurant like Melt on the corner you’d not only inject residents into an area of downtown that desperately needs more full time residents, you’d provide a terrific eating option for arena patrons and Canalside visitors of all seasons. Think about seeing those buildings renovated with residents and a sign like this adorning the street level view for Sabres fans or Canalside concert goers to see as they move past Illinois St. It’s not an ideal location, but the critical mass building along the river and the waterfront tells me that this would and will be an ideal spot to be in the very near future. Obviously a number of things would need to fall in place for any of this to happen, including having a building with an adequate amount of space for one of Melt’s locations. What I do know is that this is exactly the type of chain I’d love to see in Buffalo and it would be a phenomenal addition to the offerings of downtown Buffalo.